The Revive Adserver team is immensely proud to announce the immediate availability of the Release Candidate of Revive Adserver v4.2. We are pleased to announce the next major release of the Revive Adserver software, which has been given version number v4.2. Since this new version includes a large number of changes and enhancements, including some breaking changes, we think it is appropriate to first publish it as a Release Candidate. This will enable users, administrators, plugin developers, hosting providers and consultants to put the new version to the test in all sorts of scenarios and environments. If everything goes according to plan, we expect to release the final v4.2 in 2 weeks from today, on April 23, 2019. We’ve updated the definition of “active” Advertisers and Campaigns, to also include Advertisers and Campaigns which will become active in the future (i.e. in the “Awaiting” state), to help with their management. The Zone Probability screen now includes a link to the parent campaign for each banner. We replaced the old “weight” measure on the Zone Probability screen with the actual Campaign and Banner weights, to improve clarity around probabilities of banner display in a zone. IP anonymisation is now enabled, and OAID cookie are now disabled by default on new installations, as per our plans published in the first half of 2018 around the introduction of the GDPR. For developers: we added support for hourly statistics to the XML-RPC API. This change was contributed by the makers of the Revive Adserver REST API. We have also fixed numerous bugs, and there are also some non-backward compatible changes, so please make sure you carefully study the release notes. Important: this release candidate and the actual v4.2 release later, will have a Non-Backwards Compatible Change. Support for PHP 5 has been dropped and Revive Adserver now requires at least PHP 7.0.8. Full release notes for v4.2.0-rc1 can be found on our Github page. Revive Adserver v4.2 Release Candidate is available for download now. Please keep in mind that this is a release candidate, and as such it can result in issues. If you don’t feel confident about testing beta-level software, we recommend that you wait until the final v4.2 is available. This will be announced here on the blog, on our Twitter account, and to the subscribers to our mailing list. Once downloaded, please refer to the instructions for Installations of Revive Adserver or for Upgrading Revive Adserver. Make sure that the server(s) being used meet(s) the minimum technical requirements. Several new developments in version 4.2 have been sponsored by community members, either financially or in the form of code contributions. We’re very grateful for the support we’ve received. If you would like to contribute to our project, please consider becoming a patron on Patreon.com. 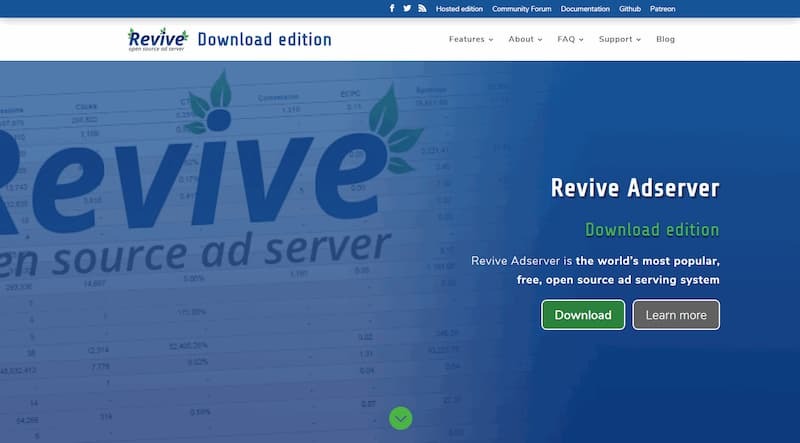 Another way to contribute to our project, is by using the Revive Adserver Hosted edition.